You are here: Home / Family Owned Business / Do You Manage From A ‘Big Picture’ Or Details Perspective? Get Ready To Zoom In And Zoom Out! Today we can no longer be the experts at the big picture or just be the details guy. We must do both. We need to zoom AND zoom out. What is your management style? Do you lead by making balancing complex markets and factors that can impact your business or do you roll up your sleeves and work out the smallest details? A few weeks back there was a TED event at the University of Michigan Flint. TED (Technology, Entertainment and Design) is a global set of conferences owned by the private non-profit Sapling Foundation, formed to disseminate “ideas worth spreading.” One of the speakers was Josh Linkner. Josh Linkner is The New York Times Bestselling author of Disciplined Dreaming: A Proven System to Drive Breakthrough Creativity, named one of the top 10 business books of 2011. Josh is the CEO and Managing Partner of Detroit Venture Partners. Together with business partners Earvin “Magic” Johnson and NBA team owner Dan Gilbert, Josh is actively rebuilding urban areas through technology and entrepreneurship. Josh recently blogged about zooming in and zooming out. Today we can no longer be the experts at the big picture or just be the details guy. We need to zoom in and zoom out. Filmmaker-photographer couple Julie Winokur and Ed Kashi were busy pursuing their careers and raising two children when Winokur's 83-year-old father, Herbie, became too infirm to care for himself. Click to watch their video. 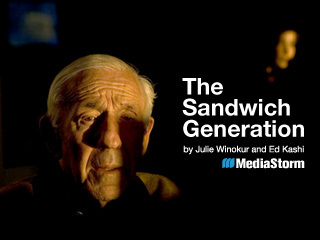 Today many of us are now in the “sandwich generation.” The Sandwich generation is a generation of people who care for their aging parents while supporting their own children. According to the Pew Research Center, just over 1 of every 8 Americans aged 40 to 60 is both raising a child and caring for a parent, in addition to between 7 to 10 million adults caring for their aging parents from a long distance. US Census Bureau statistics indicate that the number of older Americans aged 65 or older will double by the year 2030, to over 70 million. The sandwich generation at times is very challenging. Managing this complex set of demands is similar to managing a successful business. These tests, demands on time can be confusing and counterproductive. Consider these tools when faced with being squeezed. The ability to zoom in zoom out is critical in business, in Family Business and for the Sandwich generation. We must have a range. Zoom in Zoom out, think personality types, you need the opposite of you, an analyzer, an accommodator, the promoter and the strategist and maybe a few more. The best entrepreneurs, Family Business leaders have a similar ability: they can zoom out to a 50,000 ft. view of their business, but also have the ability to zoom way down to deconstruct the finest of details. Are you a big picture thinker or detail-oriented. Click here to find out. Good leaders also have good teams. Some of the better teams have no more than six diverse players. This permits them to zoom in and out, cover all the points and insures that each person counts. The sandwich generation at times has increased challenges; aging loved ones can be saddled with Alzheimer’s or dementia. We should consider methods, tools or Teammates that permit us to Zoom in Zoom out, at work, with our Families and our mates.